My first foray into both car wiring and audio. There are a few issues I’m not exactly sure how to deal with but the amp, sub, crossovers, and passenger side tweeter are all mounted and wired up. First step, I disconnected my battery and removed it from the car because I don’t trust the damn thing. I need a new battery tray and tie-down, along with a positive terminal cap thingy, and probably a battery too by now. Not to mention a deep clean behind the battery... The insulation is absolutely shredded. I’m filing this to “take care of it later” along with the rest of the ever-growing list. Amp was mounted exactly where I wanted it, in the passenger airbag cubby. I was planning to weld up a bracket, but zip ties held it in place with zero movement, so that’s good enough. Both sides are pretty accessible for the rest of the stereo install. And jo one will ever see this area anyways. Besides.... Uh... You guys. Don’t judge. Oh and I was planning to do a separate left and right channel for the crossovers, and then bridge the last two channels for the sub. As such... I followed the diagram’s instructions for a “2-channel + subwoofer system” on filter frequency and input sensitivity because I have literally no idea what any of that means. Here’s hoping it’s set up correctly. Next up was crossovers. I was originally going to mount them in the doors, but after seeing how much moisture was behind my door panel, I realized that that wouldn’t be wise. There wasn’t enough room to put them in the same cubby as the amp, which gave me one option left. Glove box. Not too thrilled to be taking up valuable storage space, but it is what it is. Some #20 tape did the job, with the crossovers both mounted to the underside of the top tray. Being in the glove box made wiring up to the amp a breeze, the crossovers are out of sight, and I can adjust them easily, so I guess this works out. Each crossover has six posts. A positive and negative going to the midrange speaker, a positive and negative going to the tweeter, and a positive and negative going towards the amp. I hooked the crossovers up to the amp first, with the right crossover being the right front channel and the left crossover being the left front. This is temporary... I’m wire nutting all connections that aren’t a spade style, and once I have everything setup in the car, I’ll go back and connect things properly. Don’t worry AMGtech, I listen! With a bridged subwoofer, two wires will remain unused on the amp, so I taped them off. Is that the correct way to deal with unused wires or is there something better..? After that, I routed wires for the sub, shoved the sub enclosure into place and connected to the two rear channels. Boom, my sub and crossovers are hooked up, now I just need speakers mated to the crossovers. Matches the OEM carpet perfectly, and fits snugly with zero movement. Put the floormat over the box and it practically disappears. The midrange door speakers—which I was expecting to be the simplest part of the install—ended up being the most difficult. First off, I couldn’t figure out a way to mount them in the stock location. I don’t have anything capable of drilling through sheet metal at the moment, and my hammer & nail tactic didn’t work. EEven when I do manage to eventually get holes in the proper location, I’m not yet sure how I’ll line things up, between the speaker, door card, door metal, backing foam, and multiple mounting bracket options. Second, I have no idea how I’m going to get the speaker wire from the crossovers routed through to the door. There’s so much difficult to remove crap in the way of the wire passover, and even if that was all gone, the short rubber tube between the door and the chassis is already stuffed full, and incredibly difficult to work with. I could remove the doors entirely, which would simplify the wire routing.... But on a scale of 1-10, my desire to remove my doors is at -8000. So I decided to skip the door speakers at the moment. I’ll revisit that problem later. That left tweeters. 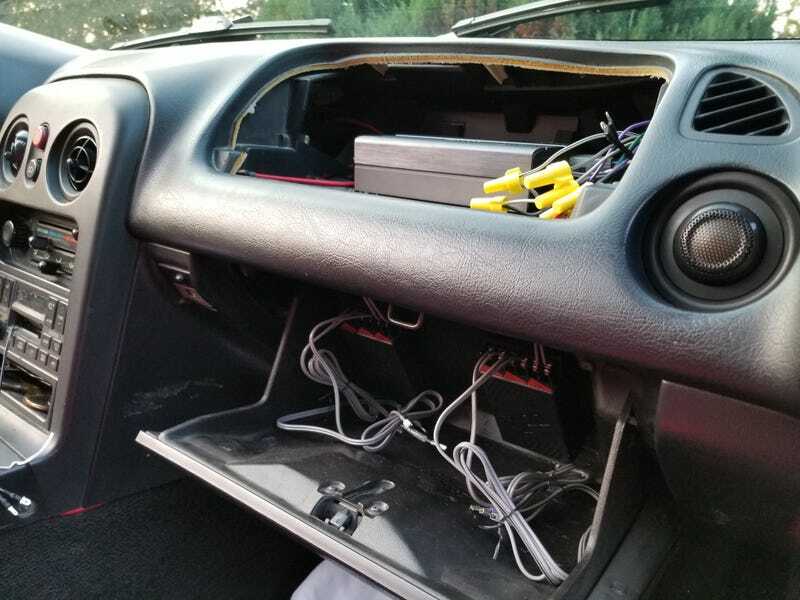 The plan was to put them in the door cards near the top, but.... I’d still have the same problem with cutting a hole and getting wires routed from the door to the chassis. So...I looked at other options. From an audio standpoint, putting them in the A pillars at ear level, firing inwards would have been ideal. Unfortunately, no way to cut through the A pillar. They came with a stick on mount so you could stick them directly on a flat surface, like the dash, but I have some pride. I couldn’t live with myself if that’s the best I managed. And then it hit me. Maybe I could McGuyver a pressure-fit bracket out of the various included mounting pieces to get the tweeters in the outer-most heater vent holes! Long story short - it worked. Here, a picture is better than words. This was a lucky break. I only ever use defrost, so these vents are unimportant to me. Now I have an almost OEM looking tweeter placement and it’s even placed in an acoustically optimal position for a good soundstage. Not quite as good as the A pillar would have been, but much better than anywhere on the door cards. Mixing parts from two brackets and a piece of the heater vent resulted in this: not pretty from behind, but it gets the job done and looks good from the front. I drilled through the thin heater vent plastic with my ancient Makita, and routed the tweeter wires through. Hooked them up to the right-side crossover after double checking the pressure fit, and everything looked good.